Today we celebrate a justice-seeking woman in scripture. Today we celebrate justice-seeking ordinands in the Association of Roman Catholic Women Priests. We will not relent until Gospel equality and justice is a reality in our church and world. In Luke’s Gospel we encounter a justice-seeking widow badgering a corrupt judge until he relents and does the right thing. According to scholars, this widow is a courageous woman without resources or family members to assist in her appeal for justice. During this time and culture, a male relative would have accompanied a woman in a court case. In this story of Gospel equality and social justice, a courageous woman wins justice by her persistent effort. Unafraid to confront a corrupt judicial system slated against her, she refuses to quit, until justice is done. Neither will we! The persistent widow is a role model for all who are seeking justice within our church and society. As Isaiah reminds us, we are called to be God’s compassion to those in need of comfort and liberation. Like deacon Phoebe, whom Paul praised as an outstanding leader in the church, we are called to lead our church today into a new era of Gospel equality and partnership, one with the community of the baptized. Today we rejoice as we ordain 4 justice seekers. Rita Lucey of Orlando, a member of Pax Christi, has been married for 63 years. She is a mother of four, grandmother of six and great-grandmother of three. As a justice-seeking woman and human rights activist Rita spent six months in federal prison to close the U.S. Army School of the Americas. Because of her witness for justice issues and her experience in prison she advocated for women in prison and served as a Hospice Volunteer for 25 years. As a priest, Rita will celebrate sacraments in the homes of Catholics who feel alienated from the Church. Kathryn Shea of Sarasota, is a mother of two children and grandmother of two grandchildren. She has been married nearly 30 years to Stephen, an ordained minister of the Disciples of Christ. As a justice-seeking woman, Kathryn protested US nuclear arms build-up and interference in Central America, and was arrested and jailed for civil disobedience numerous times. Kathryn, who is the president and CEO of the Florida Center for Child and Family Development in Sarasota, FL, is a passionate activist for the healthy development of young children, especially children at-risk. As a deacon, she will serve Mary Mother of Jesus Inclusive Catholic Community in Sarasota, Florida as a member of the liturgical ministry team. Jim Marsh of Albany, NY and St. Petersburg, FL has served his local church communities as Parish Councilor, Lector, Eucharistic Minister, and Religious Educator. In the early 1980s, as a gay man, he was involved in establishing a local DIGNITY Chapter in the Capital District region of NY where he served as a sacramental coordinator. As a justice-seeking man, he worked to create a viable Eucharistic community for those of many faith traditions who were “on the margins” of society and called “disordered” by church authorities. As a deacon, Jim will continue his ministry of service with others in promoting inclusive, egalitarian, justice-seeking communities of faith, inspired by Sophia-Wisdom. Mary Catherine White of Gorham, New Hampshire, has been married to her soul mate, Adam White, since 2006. She has two adult daughters and a five year old grandson. 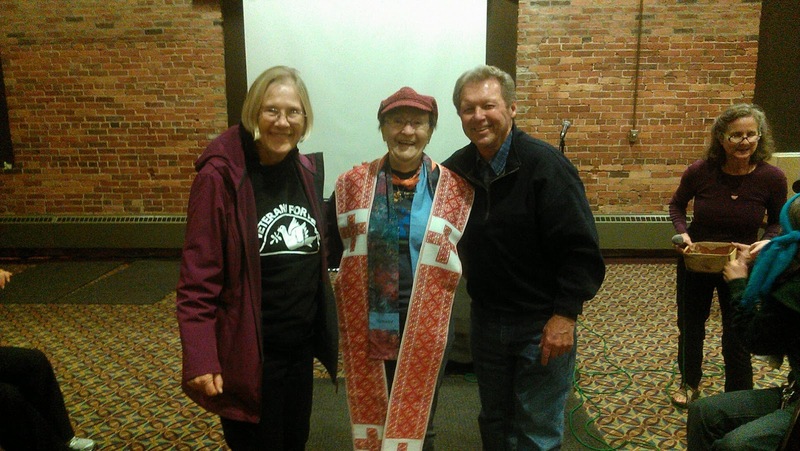 For nearly twenty years, Mary wore many hats in her local Catholic faith community: Director of Religious Education; Spiritual Director; RCIA Coordinator; Small Faith Community Coordinator; Minister of Communion who presided at Communion Services in the pastor's absence; Liturgical Dancer, and Choir member. As a justice-seeking woman, Mary is a member of a blossoming inclusive Catholic community that has called her to serve as its priest. She looks forward to her ministry with the people of New Hampshire's North Country. First, Jesus was not a priest, nor did Jesus ordain anyone a priest. The apostles were not priests or bishops. Jesus called women and men to be disciples, and treated them as partners and equals. In all four gospels, Mary Magdalene was the primary witness to the central event of Christianity — Christ’s resurrection. Third: in 1976, the Vatican’s own Pontifical Biblical Commission stated that there is no theological basis to exclude women from the priesthood. Does a teaching that states women can receive six sacraments and men can receive seven sacraments indicate that discrimination is a core issue here? The bottom line is: the church cannot continue to discriminate against half of its membership, and blame Jesus for it. When the institutional church prohibits ordination and fails to treat woman as spiritual equals at every level, it thereby, gives permission to the rest of the world to oppress and dominate women. We must make the connection between discrimination against women in the church and abuse, violence, and gender injustice the world. In the church’s recent Synod on the Family, women were not only missing from the all male, celibate voting bishops, but also, missing in the final document on church teachings that will affect women’s lives around the globe. In order to be credible, the Synod on the Family must reflect women’s experiences. They could check in with some of our women priests who are mothers and grandmothers! We are faithful Catholics who love our church and are offering it a renewed model of priestly ministry that is non-clerical and non-hierarchical, one with all in the community of the baptized. Our movement began with 7 courageous women who were ordained on the Danube River in 2002. In 2003, our first women bishops were ordained by a male bishop with apostolic succession. Therefore, our ordinations are valid, but we are disobeying an unjust male-made canon law that discriminates against women. There are now 200 in the international women priest movement in 10 countries, including 160 in the U.S. serving 60 communities. 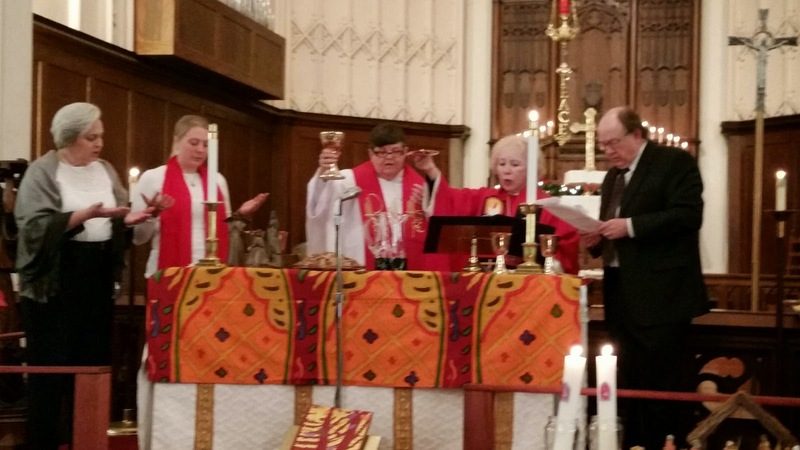 We celebrate inclusive liturgies with feminine as well as masculine images of God. All are invited to our Eucharistic table including LGBTs, and divorced and remarried Catholics. Like Rosa Parks in the Civil Rights movement we are breaking an unjust law in the Catholic Church and leading the church into living Gospel equality now. At Mary Mother of Jesus Inclusive Catholic Community in Sarasota, women priests and married priests gather around the altar with the entire community to pray the Eucharistic Prayer. Each week there is a dialogue homily. In Albany NY, the Inclusive Catholic Community is offering a spiritual home to many who have walked away from the institutional church. They are studying scripture scholarship that focuses on the life of Jesus and the central message of the Gospel. And, they are embracing a theology of blessing that requires restorative justice and equality for all. On Nov. 15, 2014, five of our women priests gathered with hundreds at the gates of Ft. Benning GA. to celebrate a Eucharist of the People on the 25th anniversary of the Martyrdom of two women coworkers and 6 Jesuits at the University of Central America in El Salvador in 1989. Georgia Walker, who was ordained a priest on Jan. 3, 2015 in Kansas City, crossed the line at the old nuclear bomb parts plant in South Kansas City to protest the toxic waste dump there. Hundreds of workers either died or are suffering from major chronic illnesses due to exposure to chemicals at that site. For her non-violent, justice-seeking action, Georgia was convicted of trespassing and was sentenced to one-year of unsupervised probation by the Municipal Court of Kansas City. Today we celebrate the ordination of Rita, Kathryn Jim, and Mary Catherine, four prophetic witnesses to Gospel equality. Like the persistent widow, our women priests’ movement is a holy shakeup rising up for justice in the Catholic Church! Polls find that most Catholics in the United States are at odds with their Church when it comes to the role of women. In a separate study last year, nearly 70 percent of US Catholics said they believe women should be ordained to the priesthood. NBC will run interview of Rita Lucey of Orlando and Bishop Bridget Mary Meehan of the Association of Roman Catholic Women Priests (ARCWP) as Rita is ordained a priest Jan. 17, 2 p.m. at Christ Church Unity, 771 Holden Ave. in Orlando. The clips will be shown on NBC Today on Sunday, Jan. 18, 8-9 a.m.EST. On Saturday, Jan. 17th at 2 p.m. the Association of Roman Catholic Women Priests will ordain Rita Lucey, 80, the first woman priest in Orlando, FL. Three deacons will also be ordained: Kathryn Shea of Sarasota, Jim Marsh of Albany, NY and St. Petersburg, FL and Mary Catherine White of Gorham, NH. The presiding bishop will be Bridget Mary Meehan of Sarasota. The ceremony will take place at 2 p.m. at Christ Church Unity, 771 Holden Ave. in Orlando. All are welcome. Rita Lucey, 80, of Orlando, a mother, grandmother and member of Pax Christi, has been married for 62 years. As a military wife of 20 years she became the Religious Education Director on military bases stateside and overseas and “was always impressed by the sharing of ONE chapel by people of all faiths.” She is a human rights activist who, at the age of 64, spent six months in federal prison to close the U.S. Army School of the Americas. Because of her witness for justice issues and her experience in prison, she has advocated for incarcerated women and has also served as a Hospice Volunteer for 25 years. She gives local talks on the UN Declaration of Human Rights. Rita has a Masters in Pastoral Studies from Loyola New Orleans. There are now 200 ordained in the international women priest movement in 10 countries, including 160 in the U.S. serving 60 communities. We celebrate inclusive liturgies with feminine as well as masculine images of God. All are invited to our Eucharistic table including LGBTs, and divorced and remarried Catholics. Like Rosa Parks in the Civil Rights movement, women priests are breaking an unjust law in the Catholic Church. ..."On Jan. 7, Bishop Robert W. Finn of the Catholic Diocese of Kansas City-St. Joseph sent Walker a letter informing her that she'd incurred automatic excommunication for participating in an ordination ceremony not recognized by the Vatican...In an email to The Huffington Post, Walker said that she was "very disappointed to be excommunicated. ""I love the Church and I particularly love the local parish in which I have previously been very active," Walker told HuffPost on Wednesday. "However, I am not at all surprised." Bridget Mary Meehan of the Association of Roman Catholic Women Priests, who conducted Walker's ordination ceremony, responded to Finn's letter on her personal website Monday. "The Association of Roman Catholic Women Priests are faithful members of the baptized who serve our beloved church in a renewed priestly ministry that welcomes all to celebrate the sacraments in inclusive, Christ-centered, Spirit-empowered communities wherever we are called," Meehan wrote. Meehan, who identifies as a bishop but whose title is similarly not recognized by the church, argued for ARCWP's claim to validity, citing the organization's "apostolic succession with the Roman Catholic Church. ""The principal consecrating Roman Catholic male bishop who ordained our first women bishops is a bishop with apostolic succession within the Roman Catholic Church in communion with the pope," she wrote on her website. "Therefore, our bishops validly ordain deacons, priests and bishops..."
Jack Smith, director of communications for the Diocese of Kansas City-St. Joseph, noted in an email to HuffPost that Pope Francis clearly reaffirmed in his 2013 apostolic exhortation "Evangelii Gaudium" that priesthood is considered the domain of baptized males only. In the same document, the pope said the church must "create still broader opportunities for a more incisive female presence in the Church," a point that Smith also addressed in his email. "For Meehan, Walker's excommunication raises larger questions about the future of women in the Catholic Church. "Women's full equality in the church is the elephant in the church's living room," Meehan wrote in an email to HuffPost. "I think the institutional church is moving in the direction of gender justice and women priests are leading the way toward the full equality of women in the church and society..."
Walker, for her part, described where she'd like to go from here in her email to HuffPost. "I intend to move ahead with my plans to form an intentional, inclusive Roman Catholic community with persons who are interested in participating in weekly liturgies," she wrote. "This type of worship community will be egalitarian, non-hierarchical and all will be free to actively participate in the worship, service and governance. All will be welcome at the table." I am very disappointed to be excommunicated. I love the Church and I particularly love the local parish in which I have previously been very active. However, I am not at all surprised. Bishop Finn enthusiastically follows the letter of Canon Law. For example, he fires gay and lesbian employees despite their competency and loyal service, he encourages the denial of sacraments to those who have divorced or who have had children outside of legal marriage and he discourages Roman Catholic parishes from sharing in ecumenical services with those of other denominations. He excludes those from the Eucharistic table who are the very people who I intend to serve! Many persons in Kansas City were afraid to attend my ordination for fear of the repercussions they might face from the chancery—from losing their jobs or being excommunicated themselves. It is a strange way to govern the church by fear in a country that strives to ensure freedom and a Church which preaches that God loves all of creation. I intend to move ahead with my plans to form an intentional, inclusive Roman Catholic community with persons who are interested in participating in weekly liturgies. This type of worship community will be egalitarian, non-hierarchical and all will be free to actively participate in the worship, service and governance. All will be welcome at the table. The members of the Association of Roman Catholic Woman Priests are leading the Church in a new direction with full participation for women and all other persons marginalized by the Church. I am a part of that prophetic movement. I have been ordained by a Bishop who has been ordained in apostolic succession and I plan to serve in the role of priest as a facilitator of worship for those who feel excluded from the traditional Roman Catholic Church. Walker says she plans to continue attending Mass at her parish church, St. James, though she will not be taking part in any liturgy. "I'm not going to take Communion," she told NCR. "I won't in any way compromise the parish, but I attend to still be part of the community and go there for worship on Sunday. "Bridget Mary Meehan, the Association of Roman Catholic Women Priests bishop who presided over Walker's Jan. 3 ordination, posted to her blog both Finn's letter and a personal response, arguing that women ordained through the association are not leaving the church, but are leading it. Rita Lucey, 80, of Orlando, a mother, grandmother and member of Pax Christi, has been married for 62 years. As a military wife of 20 years she became the Religious Education Director on military bases stateside and overseas and “was always impressed by the sharing of ONE chapel by people of all faiths.” She is a human rights activist who, at the age of 64, spent six months in federal prison to close the U.S. Army School of the Americas. Because of her witness for justice issues and her experience in prison, she has advocated for incarcerated women and has also served as a Hospice Volunteer for 25 years. She gives local talks on the UN Declaration of Human Rights. impediments indicated in canon 1331. " in living Gospel equality now. in communion with the pope. ordain deacons, priests and bishops. in the Roman Catholic Church. Norms of the motu proprio "Sacramentorum sanctitatis tutela,"
restrictions and impediments indicated in canon 1331.
to canon 1358, §1 of the Code of Canon Law. assist Georgia K. Walker if or when she seeks such process in good faith. I will no longer debate the issue of women’s ordination in the church with anyone.